Companies generate lots of documents for internal and external purposes. Xara Cloud (formerly Xara Online Designer) is an excellent tool to create these because it offers two great options; either your in-house designer creates a set of master documents for your teams to edit, or you can use Xara’s professionally designed ready-made templates to customize with your own branding and content. What’s more the Premium version of Xara Cloud also supports collaborative editing so colleagues can work together on the same document at the same time, with edits being seen live, as-they-happen, by everyone editing the document. This two-part tutorial shows you how to create a double sided flyer by customizing a Xara template to match your company branding, with your own text and photos and other content. In the first part, I showed you how to create the front page of a flyer in your company branding, changing the theme colors, text and header photo and social media symbols. See Creating your company documents Part 1 In this second part, I will show you how to share the editing with a colleague so you can both work on the flyer together, and I’ll show you how to customize the content of the document, save the document as a pdf and share it with others. If you need to create good looking documents and maybe share editing, then why not sign up to the free Xara Cloud trial and give it a go! The front and back of the flyer In Creating your company documents Part 1, you saved your document to your cloud drive, Dropbox, Google Drive or OneDrive. When you select Open you’re presented with the File Picker screen, which is divided into three sections: File picker showing your connected cloud drives at the top, the New Document templates in the center and Recent Documents in the lower area. 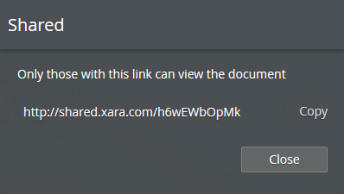 Once you’ve found the file you want to edit simply click to open it in the Xara Cloud editor. Share Editing is a great collaboration feature that’s included in the Premium version of Xara Cloud, and I’m going to use it for editing the second side of my flyer. The first thing I want to do to share the editing of this flyer document so that I can work on page 2 with a colleague. Select the Share icon and then the Share editing option where you will be able to enter the email address of anyone you want to share the editing of this document with, together with a message. You can enter multiple email addresses, comma separated, and each will receive a email inviting them to share editing of your document. When the recipient joins the editing session, the status line shows a colored label with the initial of the users editing this document. In my case, there are just the two of us editing the document (C and X). You can tap the colored label to see the email address of each user. Showing 2 people editing the document(C and X) You will now see changes that they make to the document, as they make them. Note: They are not editing a copy of the document - they are editing the same document that you are. If they click Save, it will save back to your cloud drive (because it’s your document that you let them edit). Firstly, replace the text on the template with your own text. Editing text is easy - just click or tap on your text to place a text cursor, then you can either type your text in or ‘cut and paste’ it. A slide-in Text Properties panel will appear offering the usual range of text controls such as bold, italic, etc. or use the normal keyboard shortcut like Ctrl-B for bold (see screenshot). A list of key shortcuts can be found in the Settings menu. See our movie on Editing text. As you enter your text, you will see that the columns are configured so that text overflows into the next column. It is highly unlikely that your text will match the ‘dummy’ text in the template so I’ll show you how to change the text columns later. Although it’s recommended to use the text styles provided, there are times when you need to adjust the font size, which you can easily do using the slider under the font name. I will add a photo ‘inline’ which means that it will flow with the text as I increase or decrease the text. Place the cursor in the text where you want the photo to go and then drag and drop a photo file from your computer onto the browser window, or select to Add one from the stock photos. (Select , then image and then stock photo.) The photo will be resized to fit the column width and will be embedded as an inline image. Xara provides a range of ready-made shapes that you can add to your document. What makes them so smart and easy is that the editing functions are built into the shape. There are text panels, rectangles, ovals, stars, pie charts, arrows, charts and many more. A common design element in many documents is a block of text placed on a colored rectangle. Although it’s always been pretty easy to create this using the normal graphics tools - just draw a rectangle and place a text column or text frame on top of the rectangle, and then group them. The problem with that is that each time you change the text, you would need to adjust the background rectangle. can directly adjust the panel width and height, rounded corners and the margin space between the text and outer rectangle. You can edit the text as normal including setting text styles, fonts and links to web or email addresses. To add a Text panel select the Add icon , then select the Text option which will open up the menu of text objects. Scroll down to see the Text panels and select one. It will be placed on your document in your theme color. It is already selected so click on the outer edge to move it into position. Then click on the text to change the text. Notice how the text panel with adjust as you add your text. Anyone working on the document can add comments - which are small text boxes outside the page attached to some text in the document. Comments are often messages to others working on the document, or just notes to yourself. The great thing about comments is that your colleagues can edit and add text to your comments - you can have a little thread of a conversation. To add a comment, highlight the text that you wish to comment on, and select the Add comment option on the pop-up menu. A comment box appears to the right of the workspace, where you can just add you comment text. Tap the top edge of the comment box to bring up a context menu with a Reply or Delete option. The comment remains locked to the text (so it moves as you move the text) but you can drag the comment box anywhere on the page. You can resize it (tap the title, and then drag the right-side handle), as well as changing text color and all the usual text attributes using the text controls. A typical comment is shown right. 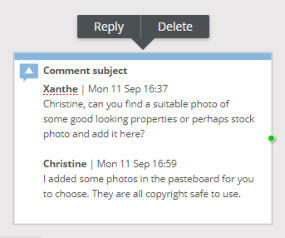 The ‘Comment subject’ is editable. Tap the top of the comment to see the context menu. When any user selects the Reply their name and date is added. When you tap the top bar of comment the corresponding text in the main document is highlighted a darker blue to indicate the text this comment applies to. The Documents menu has a Download option that allows you to download the document as a high-quality PDF. Select the Documents menu, then Download, then Download PDF. Select the format and then select Download. Here’s a short movie on downloading PDFs. Although creating a PDF is easy and a great way to distribute a printable version of your document. There’s an even easier way of sharing your finished document. Select the Share icon and the Share… option. This produces a private link to a static read-only version that you can share with anyone. After a few seconds you’ll get a confirmation dialog as shown below: The Copy option places the URL link on the system clipboard. Or you can just click the link to open it in a new browser tab. This is basically like publishing a website - except you don’t need to worry about web space, FTP configuration or hosting, and it’s a lot quicker! Note: If you make further changes to the document, these are not automatically shared until you do another Share.. operation. This allows you to continue working on draft changes, and only update the read-only shared version when you want to. If a document is already shared, you’ll get a simple ‘update’ option to re-publish the latest updates. The shared private link to a static read-only version That’s it! You and your colleagues can now create your own company documents in your own branding and share it by circulating either the pdf or the link to the online version. If you’re a Windows 10 user here’s a great time-saving way to incorporate screen grabs into any document. Windows 10 has a short cut to grab any part of the screen. Just press ‘Shift + Windows key + S’, the screen fades, and you now have cross hairs that you can drag across any part of the screen. At the end this places that piece of screen on the system clipboard. Now you can just paste this directly into your document - just press Ctrl+V. This works with Xara Cloud as well as our desktop software products. See our introductory movies - part 1 and part 2. You can find more details and a full list of our current tutorial movies on our Xara Cloud page. 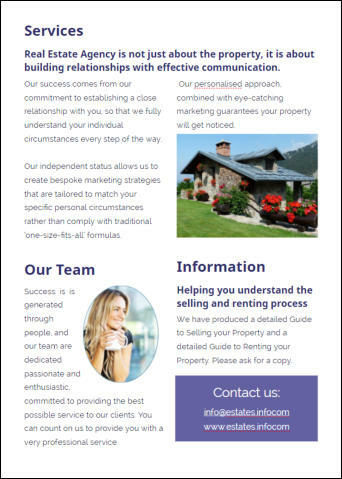 The Xara Cloud templates include an ever growing selection of all the most common business documents, including social media headings, presentations, CVs, flyers, catalogs, booklets, product sheets, e-books and web banners. You can browse the templates and start editing immediately by selecting Edit This Template here. Or maybe you’d like to try the unique offline/online experience offered by Xara, whereby you can edit your documents either online or offline - download the free trial of Xara Web Designer or Photo & Graphic Designer or Xara Designer Pro X and sign up for the free trial of Xara Cloud now! Copyright © 2018 Xara Group Limited. Companies generate lots of documents for internal and external purposes. Xara Cloud (formerly Xara Online Designer) is an excellent tool to create these because it offers two great options; either your in- house designer creates a set of master documents for your teams to edit, or you can use Xara’s professionally designed ready-made templates to customize with your own branding and content. What’s more the Premium version of Xara Cloud also supports collaborative editing so colleagues can work together on the same document at the same time, with edits being seen live, as-they-happen, by everyone editing the document. 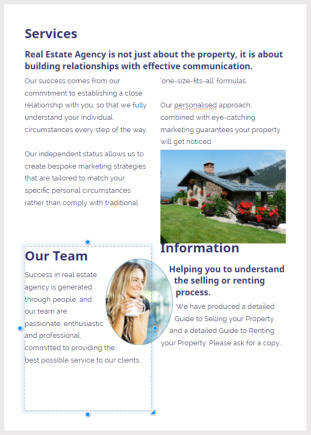 This two-part tutorial shows you how to create a double sided flyer by customizing a Xara template to match your company branding, with your own text and photos and other content. In the first part, I showed you how to create the front page of a flyer in your company branding, changing the theme colors, text and header photo and social media symbols. See Creating your company documents Part 1 In this second part, I will show you how to share the editing with a colleague so you can both work on the flyer together, and I’ll show you how to customize the content of the document, save the document as a pdf and share it with others. If you need to create good looking documents and maybe share editing, then why not sign up to the free Xara Cloud trial and give it a go! The front and back of the flyer In Creating your company documents Part 1, you saved your document to your cloud drive, Dropbox, Google Drive or OneDrive. Firstly, replace the text on the template with your own text. Editing text is easy - just click or tap on your text to place a text cursor, then you can either type your text in or ‘cut and paste’ it. A slide-in Text Properties panel will appear offering the usual range of text controls such as bold, italic, etc. or use the normal keyboard shortcut like Ctrl- B for bold (see screenshot). A list of key shortcuts can be found in the Settings menu. See our movie on Editing text. As you enter your text, you will see that the columns are configured so that text overflows into the next column. It is highly unlikely that your text will match the ‘dummy’ text in the template so I’ll show you how to change the text columns later. margin space between the text and outer rectangle. 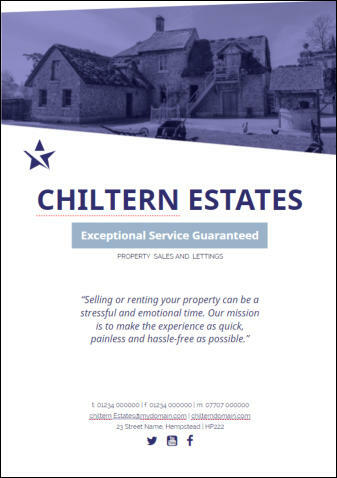 You can edit the text as normal including setting text styles, fonts and links to web or email addresses. To add a Text panel select the Add icon , then select the Text option which will open up the menu of text objects. Scroll down to see the Text panels and select one. It will be placed on your document in your theme color. It is already selected so click on the outer edge to move it into position. Then click on the text to change the text. Notice how the text panel with adjust as you add your text. Companies generate lots of documents for internal and external purposes. Xara Cloud (formerly Xara Online Designer) is an excellent tool to create these because it offers two great options; either your in-house designer creates a set of master documents for your teams to edit, or you can use Xara’s professionally designed ready-made templates to customize with your own branding and content. What’s more the Premium version of Xara Cloud also supports collaborative editing so colleagues can work together on the same document at the same time, with edits being seen live, as-they- happen, by everyone editing the document. 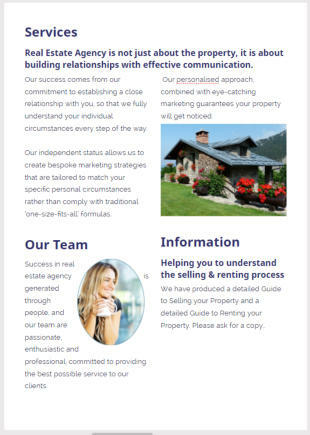 This two-part tutorial shows you how to create a double sided flyer by customizing a Xara template to match your company branding, with your own text and photos and other content. In the first part, I showed you how to create the front page of a flyer in your company branding, changing the theme colors, text and header photo and social media symbols. See Creating your company documents Part 1 In this second part, I will show you how to share the editing with a colleague so you can both work on the flyer together, and I’ll show you how to customize the content of the document, save the document as a pdf and share it with others. If you need to create good looking documents and maybe share editing, then why not sign up to the free Xara Cloud trial and give it a go! The front and back of the flyer In Creating your company documents Part 1, you saved your document to your cloud drive, Dropbox, Google Drive or OneDrive. rectangle. You can edit the text as normal including setting text styles, fonts and links to web or email addresses. To add a Text panel select the Add icon , then select the Text option which will open up the menu of text objects. Scroll down to see the Text panels and select one. It will be placed on your document in your theme color. It is already selected so click on the outer edge to move it into position. Then click on the text to change the text. Notice how the text panel with adjust as you add your text.